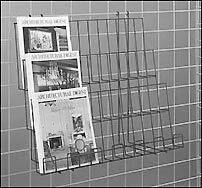 Grid Wall Panels and accessories; Welded wire construction Grid panels and accessories. 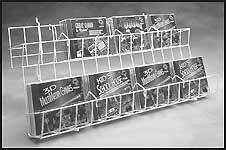 Floor standing Grid displays, racks and merchandisers. 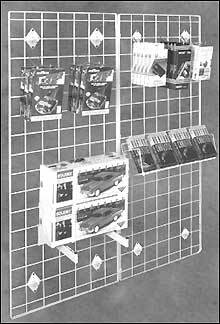 Use Grid Panels for continuous wall displays, islands or integrated with other merchandisers for economical and versatile merchandising solutions. 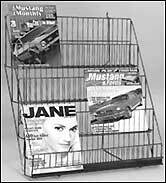 Floor standing grid merchandisers and Power Wings below (Click this link). Versatile econo-grid panel system assembles quickly and easily. Hang panels on a wall to fill empty space or use them with our leg sets to create free standing fixtures. Connectors (below) available for your custom installation. Panels accommodate 5 rows of shelves. White or Black Powder Coated finish SHIPPING: Econo Grid panels ship in carton categorized as "Oversize-2" by FedEx - 95 Lbs. Minimum billable weight. your ZIP code for Shipping Charges. 10 + Panels in this group, ordered at same time, shipped to same address, qualify for quantity discount. SHIPPING: Please Inquire with your ZIP code for Shipping Charges. Perfect for Magazines, Papers, Literature, Books, Software, etc. Perfect for Magazines, Papers, Literature, VIDEO, DVD and Books. 20 + Displays in this group, ordered at same time, shipped to same address, qualify for quantity discount. 1-1/2" grid compatible hooks below SHIPPING: This display ships in carton categorized as "Oversize" by FedEx - 42 Lbs. billable weight. 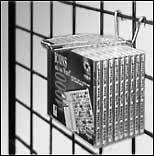 Power wing and Grid compatible hooks below SHIPPING: This display ships in carton categorized as "Oversize" by FedEx - 42 Lbs. billable weight. 5 + Power wings, ordered at same time, shipped to same address, qualify for quantity discount. Power wing and Grid compatible hooks below SHIPPING: This display ships in carton categorized as "Oversize" by FedEx - 95 Lbs. billable weight. Accommodates cards up to 5x7"
ALL RETURNS must have prior authorization from us. Orders canceled after shipment, refused deliveries and returns may be subject to 25% restocking fee unless other arrangements have been made. All merchandise must be in the ORIGINAL packaging and in resaleable condition. Customer is responsible for ALL shipping charges on returned items unless other arrangements have been made. Claims for damage sustained in shipping must be made immediately and recipient must keep damaged goods and all packaging materials for carrier's inspection until claim is settled.